I See a Song by Eric Carle | Stacy Benge, M.S. Posted in Children's literature, Classroom activities, Cognitive development, Language development, Literacy development	by Stacy Benge, M.S. 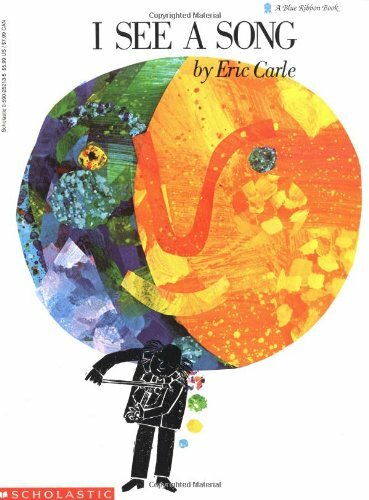 Probably not one of the books that comes to mind when you think of Eric Carle, but his book I See a Song is my favorite! “Ladies & Gentleman! I see a song. I paint music. I hear color …. Come, listen, and let your imagination see your own song.” says the violinist illustrated in a monochromatic black. But as he begins to play, colors begin to fill the pages. Pictures begin to form and the song begins to tell a colorful story. When I was teaching, I would read the introduction to my class, then, I would play music – different types of music. Some days it would be light classical while others, it might be slow jazz. I would ask my learners if the illustrations matched the music as I turned the pages. Did they feel the pictures were telling the story of the music they were hearing? Why or why not? I enjoyed hearing their explanations. I loved watching them feel and connect to the music. Many times, as an extension to the book, I would provide blank paper with crayons or paint, and I would play different types of music; again, it varied day-to-day. I encouraged the children to turn the songs they were hearing, and feeling, into pictures. I wanted them to interpret the songs on to paper and make the music come alive. I loved their descriptions when I asked them to tell me about their drawings. What an amazing experience to watch the children connect to the music and “see a song”.